In the fall of 1986, a Bulgarian lady gave birth to Svetoslav (also referred to as Svet by foreigners). Svetoslav was a curious boy who started learning English at the early age of 6. Later, in high school, Svet upgraded his English skills and started learning the language of Germany. Since their love was not very saccharine, after joining the university, he decided to pursue French – the language of diplomacy (read “love“). After graduating in International Relations, he went to Belgium (Leuven) to follow a Master’s degree in European Policies and Politics. While deciphering the law of the European Union, he frequently indulged in Belgian beers, salivated on Belgian waffles, and all his senses celebrated when his delicate palate met the scrumptious Belgian chocolate for the first time. His career in politics was quite short-lived as he quit his job for a government commission after almost two years of working for its “International Relations” Department. Svet dedicated his free time to some freelance translation, working out, cooking, and figuring out what to do in the future. In the meantime, a friend of his and he were organising their first trip to the Middle Kingdom. After meeting a Chinese girl in a hotel in Geneva, Svet received an invitation to visit her in Beijing so he did not think too much. 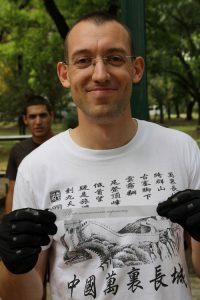 The Chinese capital flabbergasted him and soon after he came back to Sofia, he ferociously started decoding Chinese characters. Months later, he was approved for a 3-month work programme in Guangzhou where he explored the Chinese City of Flowers with thirsty eyes, practised what he had learnt, and basically had tonnes of fun. That’s when he got his first idea of creating his own blog which came to fruition a bit after he came back from China – in September 2015, to be exact. Meanwhile, since he was not challenged enough, he embarked on delving deeper into the Spanish language, thus enriching his linguistic skills further. As an avid voyager and street fitness maniac, he mainly blogs about travel, motivation, and healthy living. It’s more than obvious that his passions revolve around writing and foreign languages and that’s how he earns a living. For ad space, writing projects, or copy critique, apply to work with Svet through the form below.